Sometimes even travel writers can be surprised when they stumble upon an unexpected treat. 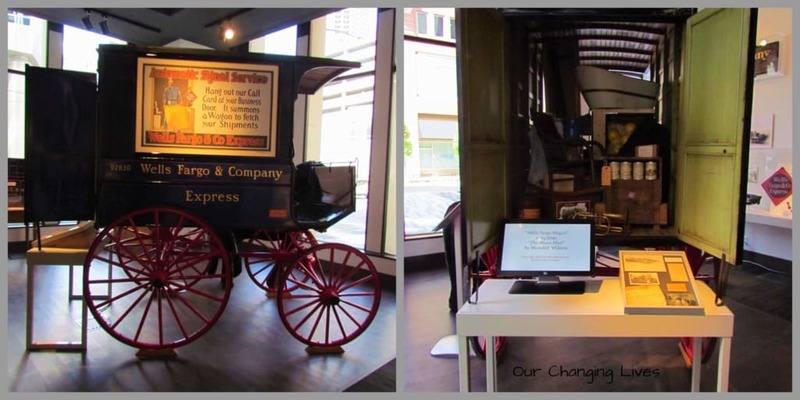 Such is the case when we visited the Wells Fargo Museum in downtown Des Moines, Iowa. 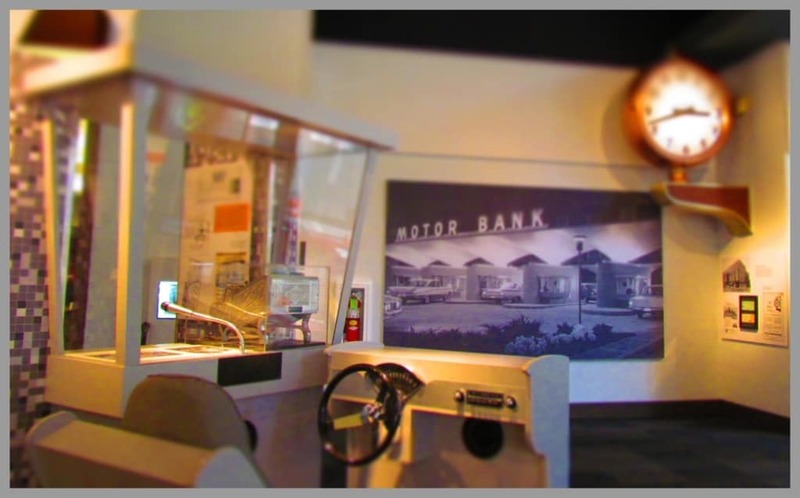 This free museum is located in their bank lobby, and is the newest in a string of museums that Wells Fargo hosts. When we discovered this unique attraction, we didn’t have high expectations for an interactive experience, but we soon discovered it holds more than we had hoped for. We want to thank Wells Fargo for their hospitality. Rest assured that all opinions are our own. The main purpose of the museum is to highlight the role Iowa played in the early connection of travel across the nation. The country was expanding rapidly and communication was struggling to keep up. Lots of enterprises, like the Pony Express, sprang up to offer temporary relief of these problems. (You can read about the Pony Express Museum here>) The railroad was building its intercontinental line, but in the meantime many travelers were resigned to travel by stagecoach. It was also a primary form of delivery for the mail and banking institutions. 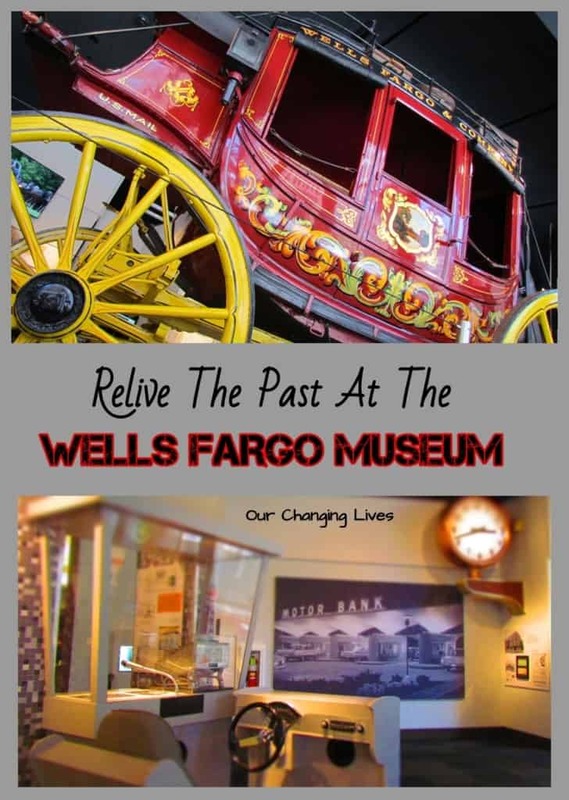 The Wells Fargo Museum has a number of displays that spell out the history of these changes, as well as offering a glimpse at artifacts from those days. Have you ever had one of those Aha moments where you suddenly connected the dots? This was the case for us when we saw the Wells Fargo wagon, which is a model of the one used in the movie The Music Man. Suddenly, we see how companies tie back into the everyday lives of those who came before us, and it gives us a connection to the past. It is only appropriate for us to see this particular device in Des Moines, since the original play was written by the Iowa native, Meredith Willson. We do have to wonder how many of the younger visitors miss this connection and move right past to the hands-on exhibits. 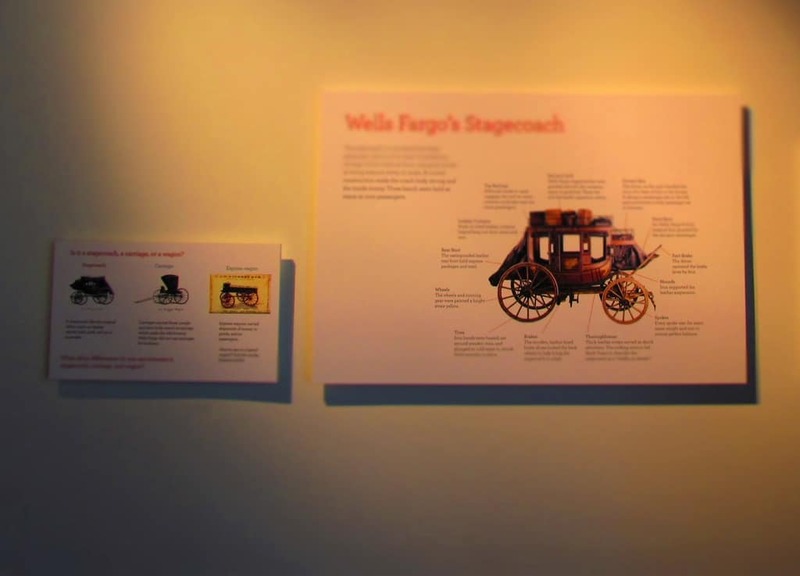 We figured the Wells Fargo Museum would be filled with a grouping of static displays that told the chronological history of banking through the ages. The idea that there would be lots of interactive exhibits had not even crossed our minds. You can imagine our pleasant surprise when we discovered that there are lots of hands-on artifacts for little (and big) hands to hold. 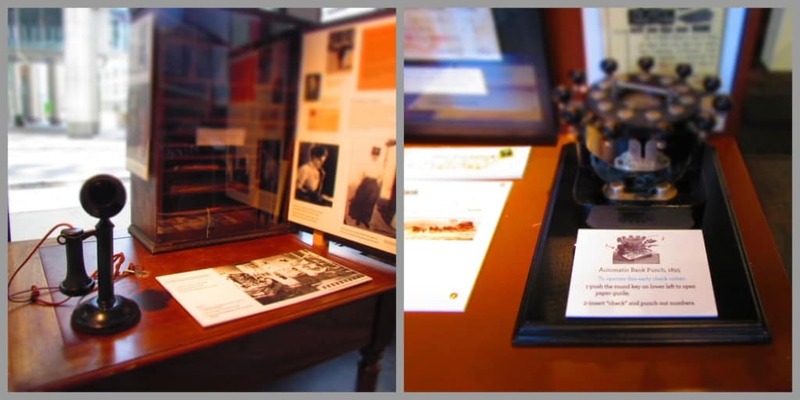 Visitors to the museum can explore old telephones, telegraphs, and bank punches. Each of these exhibits include educational information to help understand how the devices were used in the “good old days”. They even have an area where you can get your own picture printed on money. I’m pretty sure that a bank note with my mug on it would certainly be worth at least five dollars, if not a couple more. This particular exhibit makes for a nice souvenir from your visit, and we are betting the kids will all want one. Traveling by stagecoach has been romanticized by Hollywood for quite sometime. The horse-drawn Concord stagecoaches are easily recognizable to most Americans. The suspension of the coaches were designed to take the constant abuse from the rough roads that they traveled. Leather straps were used to help absorb some of the jarring that would have come from the rough trails and create a swaying effect for the passengers. At the museum they have a display coach where visitors can recreate the feeling of stagecoach travel. 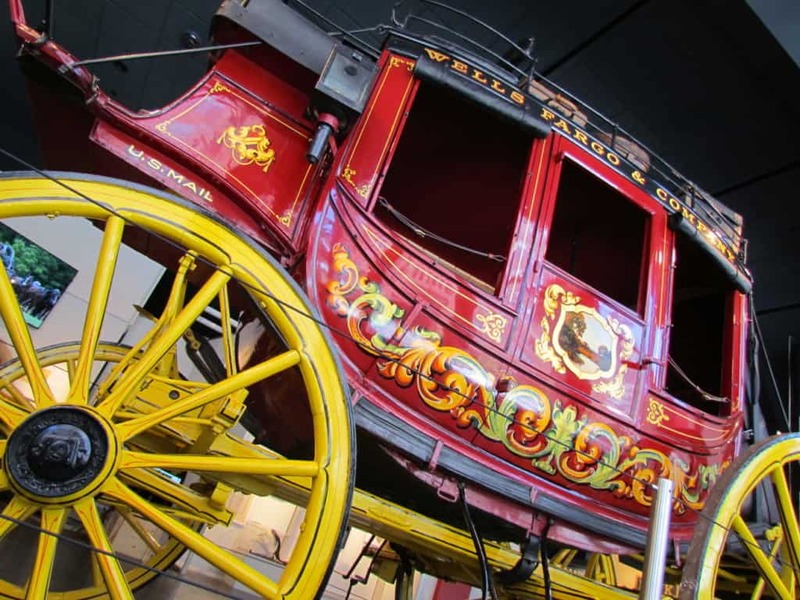 Nearby you can see a full-size stagecoach decked out with the familiar red-gold paint job that signified it was part of the Wells Fargo family. While stagecoach travel seems like the way to cross the country, it wasn’t all it was cracked up to be. Travelers were subjected to lots of uncomfortable situations. The museum has an interactive display that shows some of the real life situations that stagecoach travelers would have faced during their journey. After seeing some of the real facts, we are happy to have our automobiles and modern highway systems. Watch the video and tell us how you would have liked traveling by stagecoach. 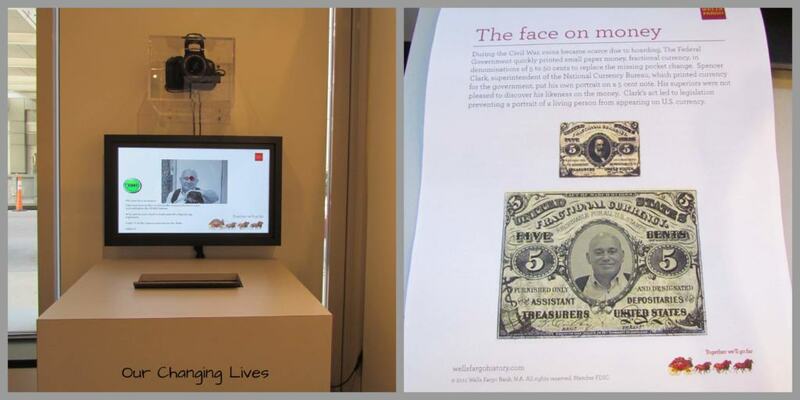 Since the museum is based in part on banking, it only seems appropriate for it to show the advances through the ages. The invention of automobiles certainly changed how people get places and signified a death toll for many of the start-up travel industries. These days we all are familiar with drive-thru banking, which began in the 1930’s. As technology advances, so do our means of travel. We can all be glad that we have more comfortable options than stagecoach. Let’s leave that method to the movies. For now, it’s enough to just pretend that we are riding one in this interactive museum. Ready to hit the trail? Why not share this article with some of your trail-buster friends?!! Next time I’m in a big Wells Fargo Bank, I’ll have to check this out. There are two other great museums of early American transportation not far from Des Moines, btw. There’s the railroad museum in the old library in Council Bluffs, and the Durham Museum in the old Union Station of Omaha. Check them out next time you’re in the area. We have visited and written an article on the Durham. We will need to check out the railroad museum in Council Bluffs. Thanks. I confess that I am not a museum person but you do make the Wells Fargo museum sound worth visiting. I had to chuckle at your comment that ‘we are all familiar with drive-thru banking’ – in the US perhaps, but not in the rest of the world. Australia, where I live, has no drive thru banks that I am aware of and I don’t think I have ever seen one in Europe either. Wow! I never realized it was such a regional concept. Thanks for the insight. Wells Fargo is doing a great service for the American people. I would like to see a list of all Wells Fargo Museums across the country. Just surfed. There’s one in Phoenix!!! Will go see it. Thanks. Would love to see pics from your visit. Hope it’s as fun as the one in Des Moines. I didn’t realize there are Wells Fargo Museums around the country. But I did know about the one in San Francisco. We’ll have to check it out sometime. It is amazing the treasures we find as travel writers along the way. The Wells Fargo Museum is certainly a good example of that. The displays look so interesting and educational. Thank you for sharing! It was our pleasure. We appreciate you taking the time to visit our site. Sounds like the Wells Fargo Museum was a great find. I’ll have to keep an eye out next time we’re in the US. I have an ancestor who was a Pony Express rider back in the 1860s. I would love to learn more about that era of transportation and this looks like a great place. That would be an interesting person to research. We can only imagine the experiences they must have faced. There is a pony express museum in St Joseph Mo. A train museum in Atchison, Ks. Also along the Santa Fe trail is the battle of black jack museum near Baldwin City, Kansas. Also interesting is the Clinton Lake museum (near Lawrence Ks)that is located on Corps of Engineer land on the way to the beach. The last two are lessor know sites that made me say – wow, lived here most of my life and didn’t know that. There is so much history in this part of the country that most people are unaware of. A complete list would be rather long. We have had the pleasure of visiting some of these sites, and even have articles on our website featuring them. It is true that there is plenty of history in this region. People just have to get off the interstates to find it.